3.1. How do I type XML texts? 13.1. Where do I put इति? 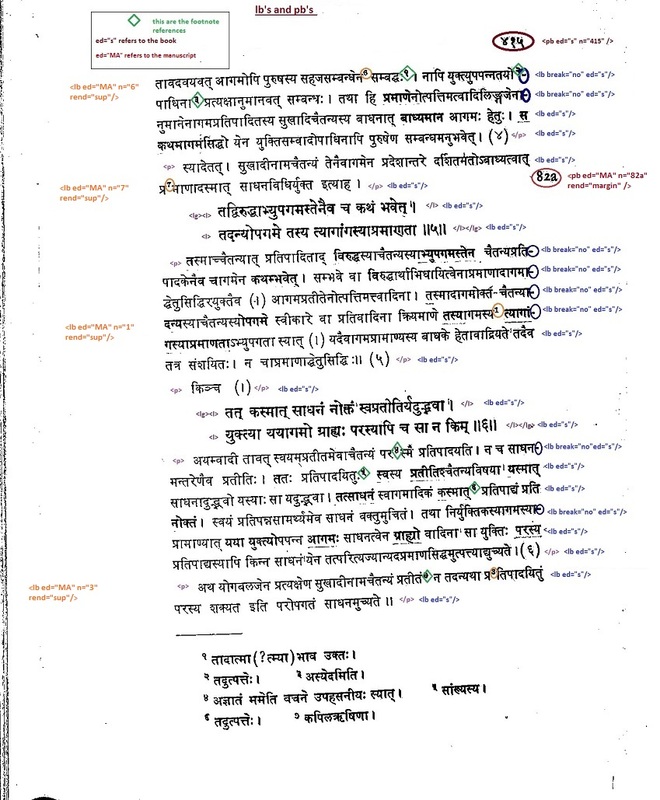 This document presents guidelines for the creation of digital texts in Sanskrit, Prakrit, and other Indian languages. to promote the production of TEI-conformant digital texts in the community of Indian studies. The guidelines come in two varieties: simple and full. The simple guidelines (this document) document the minimal level of encoding that SARIT requires of texts in its collections. These guidelines provide a straightforward path “from printed edition to digital text,” and should suffice for the purposes of most projects. The full guidelines supplement the simple guidelines. The TEI standards that SARIT follows allow for encoding features of a text that aren’t typically included in “plain” digital texts. The full guidelines provide guidance for these advanced features. If you want your digital text to reflect textual variation (in the form of a critical apparatus or otherwise), cross-references within the text or references to other texts, or any kind of controlled vocabulary (persons, works, places, etc. ), then the full guidelines are for you. Texts that are encoded according to the simple guidelines can always be “enhanced” at a later stage with the markup described in the full guidelines. Digital texts come in a variety of formats, but the texts distributed by SARIT are XML files that conform to standards of the Text Encoding Initiative (TEI). In a well-formed XML document, every starting tag corresponds to an ending tag, and vice versa, and all of the elements are arranged hierarchically and without overlapping. But in order to be useful, the document must use elements in a well-defined and standardized way. A document that formally defines what elements may be used in an XML document, and how they may be used, is called a schema. Once you have well-formed and valid XML, what can you do with it? There are many computer programs that can read an XML text and do all sorts of interesting things. One of the first things you may want to do is to check that the file you have painstakingly prepared really is well-formed. That is the work of a so-called "XML Parser." It can check your text and flag up inconsistencies in the markup, making sure that it validates against a schema. But that is only the beginning. Since XML provides a structure that computers can easily navigate, it is easy to find any part of a document. You can index these parts in a database for searching, or you can transform them into a format that human beings can read: HTML, RTF, or PDF. XML texts can be converted into almost any other format, or processed in many complicated ways using a super-strength version of search-and-replace called XSLT. An XML document has no hidden codes, and can be typed with any writing program from the simplest editor to the most feature-rich word processor. Many modern programs have XML "modes" that provide things like syntax-highlighting or online help; others have been created specifically for typing XML. Several of these programs have XML Parsers built in to them, so that they can check your input as you go along and perhaps even format it nicely on the screen. The Text Encoding Initiative produces guidelines for encoding texts as XML documents and schemas for validating those documents. The TEI guidelines have been used, and continue to be used, in hundreds of text-encoding projects, and form the basis of many other subprojects (such as EpiDoc). They are actively maintained and well-supported by a growing number of applications, and hence they currently represent “The Right Way” to produce digital texts. This element has two attributes. The xml:id is a unique identifier for the document. Your choice for this unique identifier will depend on your project. The xmlns attribute tells whatever program opens the document that the names of the XML elements are the names defined by the Text Encoding Initiative: for example, that the element <p> is what the TEI defines as <p>, and not what any other authority defines as <p>. The last line of the document will close the <TEI> element, and hence it will always be </TEI>. The XML processor will ignore anything that is contained between <!-- and -->. The xml:id attribute assigns a unique identifier to an element, so that the element can be referenced from anywhere else in the document, or even in a corpus of documents. But the functions that depend on unique identifiers—indexing and cataloguing, for example—are better left to automatic processes. And since xml:id attributes need to be unique, and need to have a certain format (NCName), it’s easy for humans to introduce errors that will throw a wrench into these automatic processes. That’s why SARIT recommends against the use of xml:id attributes within a document. If xml:id attributes are needed for technical reasons, it’s better to let those technical reasons determine how these xml:id attributes are to be generated and assigned. A document will still be valid if you use xml:id attributes, and there are certain cases (such as referencing readings in a critical apparatus to the main text) where you might find xml:id attributes useful. But in general, nothing is lost by omitting xml:id attributes, and often compatability with certain programs (such as SARIT’s XML database) is gained by omitting them. sa-Deva: Sanskrit in the Devanāgarī script. pra-Deva: Prakrit in the Devanāgarī script. See SARIT’s character-encoding guidelines regarding issues of script and transliteration. The xml:lang attribute is heritable: if you say that a certain element is in a certain language, then all of the children of that element are assumed to be in the language as well. Thus we need to specify a language at the highest level of its occurrence: <teiHeader> will almost always take the attribute xml:lang with value en, and <text> will almost always take the attribute xml:lang with value sa-Deva or sa-Latn (see above). Apart from this initial specification, we only need to specify the language of an element if it is different from the language of its parent element: for example, if you have an English note to a Sanskrit text, you will generally give the <note> element the xml:lang attribute the value en. Because XML uses tags rather than whitespace elements (line-breaks and indentation) to mark the logical structure of the document, XML has no hard-and-fast rules for whitespace: a single element, consisting of a starting-tag, content, and an ending-tag, might occur on one, three, or forty lines. Different text editors also have different conventions for putting whitespace into XML documents. which will lose the spaces when it is processed. the course of its history. All of this information is provided in a section of the document called the header, which is contained in the element <teiHeader>. <teiHeader> is a direct child of the top-level element <TEI>. And since the metadata will typically be in English, we typically specify the language of the <teiHeader> element with xml:lang set to en. The TEI Header has three obligatory sections: one for the description of the file (<fileDesc>), one for the description of the file’s encoding (<encodingDesc>), and one to record the file’s history (<revisionDesc>). We’ll talk about these three sections in order. But SARIT also provides a template document that shows how the header should be structured (https://github.com/sarit/SARIT-corpus/blob/master/00-sarit-tei-header-template.xml). It is important to distinguish between the work and a specific representation of that work. A work is an abstract object, such as Hamlet or Abhijñānaśakuntalā considered as ideas in the mind. A printed edition of a work and a digital edition of a work are both representations. In most cases a specific printed edition will be the source of the digital edition and must be acknowledged as such. Since printed editions are protected by copyright laws—although not to the same degree in all jurisdictions—you must ensure that you are legally entitled to use the printed edition as the source of the digital edition. The file description element (<fileDesc>) contains the most essential metadata: a statement of the title and author of the text, which is essential for cataloguing and indexing (<titleStmt>); a statement of how, under what authority, and under what license the digital text is published (<publicationStmt>), and a description of the digital text’s sources (<sourceDesc>). In the following example we have a base text and two commentaries. When there is only one author for each role, it is easy to link authors with the titles of their works. But when there are more than one author for each role—as is the case with multiple commentaries—we need to supply extra an extra n attribute. In addition to providing information about who produced the work that forms the basis of the digital text, namely the author, the title statement also provides information about who helped to produce the digital text. This includes funding agencies, principal investigators, data enterers, and so on. The last obligatory portion of the file description is the source description, which tells us the sources on which the digital text is based. This will often be the most extensive and detailed part of the TEI Header. Usually, there will be one edition that the digital text is primarily based on. We want to distinguish this “main source” from other sources that supplement the main source, or “second-level” sources (the sources of the digital document’s sources). Thus, by convention, the first element in the source description is understood to be the main source. In order to be completely explicit, however, SARIT recommends that the role of each source in the constitution of the digital document should be briefly explained with a <note>. TEI provides a number of ways of tagging bibliographic information, but SARIT recommends the use of <bibl>. This is a relatively flexible element which should accommodate book, articles in journals, and articles in collections. The following are examples for different kinds of printed sources. The most common is a book, which has one or more titles (<title>), one or more authors (<author>), usually one or more editors (<editor>), and the standard publication information (<publisher>, <pubPlace>, and <date>). Note that it is best practice to encode names of modern-day authors and editors using the <name> element and its sub-elements, <surname> and <forename>, in order to make it easier to sort and reformat bibliographic entries. ). Note also the use of the <biblScope> element to represent a page range. The sources for our printed editions are almost always manuscript sources. And when the printed editions refer to these manuscript sources, as responsible editions do, it is useful to provide a description of the manuscript that readers of the digital text will be able to refer to. The proper element for this description is <msDesc>, and it is contained directly within the <sourceDesc> element, alongside any bibliographic sources (<bibl>). After the file description, TEI documents require an encoding description (<encodingDesc>). The purpose of the encoding description is to document the choices that were made in encoding the text, especially if there may be uncertainty or ambiguity, for instance regarding how the different layers of base text and commentary are represented in the TEI document. At the moment SARIT provides no specific guidelines for the encoding description. The <encodingDesc> element of SARIT texts generally consists of prose paragraphs (<p>) that explain the encoding choices specific to the text. There should be no need of noting encoding decisions that conform to these guidelines. We do, however, recommend the use of three elements that are available in the encoding description: <projectDesc>, <tagsDecl>, and <refsDecl>. The tagging declaration (<tagsDecl>) may be used to document the usage of specific tags in the text and their rendition if applicable (see the TEI P5 guidelines: http://www.tei-c.org/release/doc/tei-p5-doc/en/html/HD.html#HD57). Most projects will not use the tagging declaration. Prose paragraphs (<p>) are also permitted in <change> elements, but lists are preferred. The <text> element is the last child element of <TEI>. documents. They are linked to each other (i.e., the commentary includes references to the base text) through the procedures described in the full version of the guidelines. 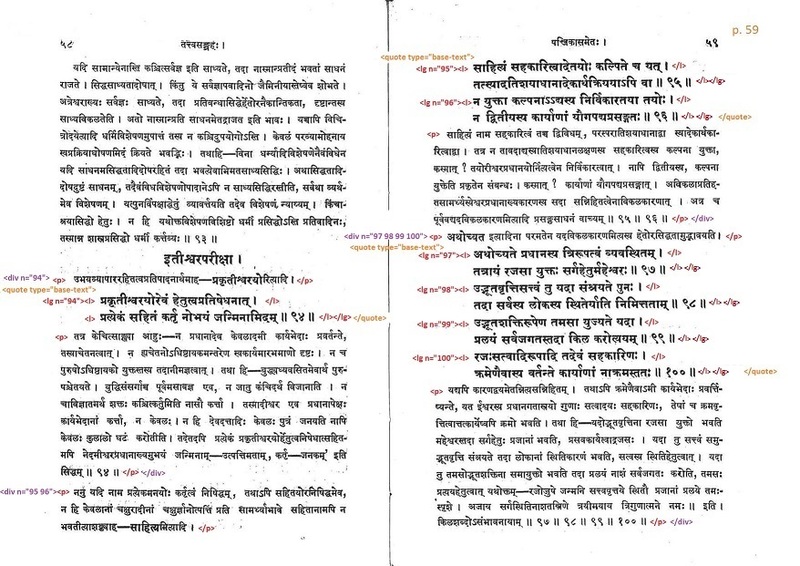 For example, SARIT includes a text of the Daśarūpaka of Dhanañjaya, together with the Avaloka commentary by Dhanañjaya’s brother Dhanika. These two texts are encoded in a single document. 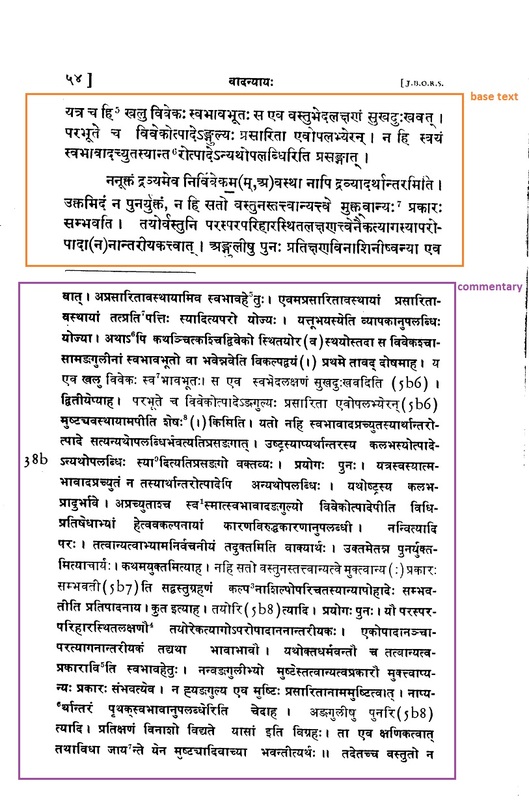 A further commentary on the two texts, the Laghuṭīkā of Bhaṭṭa Nṛsiṃha, is encoded in a separate document that refers back to the original document. Generally speaking, if the base text and commentary are printed in the same register on the page (the base text being in a larger font or in bold, see below example 1), it makes sense to encode them together; if the base text and commentary are printed in separate registers (see below example 2), it is easier to encode them separately. These guidelines will tell you how to encode the base text and the commentary together. Please consult the full version for guidance on how to encode them separately. SARIT recommends a model in which the base text is “embedded” in the commentary. In other words, we presume that everything in the <text> element represents the commentary unless specified otherwise. The rest of this section will deal with how to specify otherwise. As in the above example, we recommend making the <quote> element that contains the base text a sibling rather than a child of the elements of the commentary (<p> and so on). That is, the <quote> element should be a child of the same structural division (see below) as the elements of the commentary. In almost every case, the structure of the base text and commentary will be the same. This means that a given reference, such as 1.4.5, should be able to identify both the base text and the corresponding section of commentary. The easiest way to accomplish this is to put the base text and the corresponding section of commentary within a single structural division. This enclosing division is meant to gather the two texts together for the purposes of display and reference. Note that an n attribute is assigned to the enclosing division. This is optional, but it helps to identify the section of the commentary with the verse-number of the base text that it comments upon (which is identical with the n attribute of the quoted <lg> element). 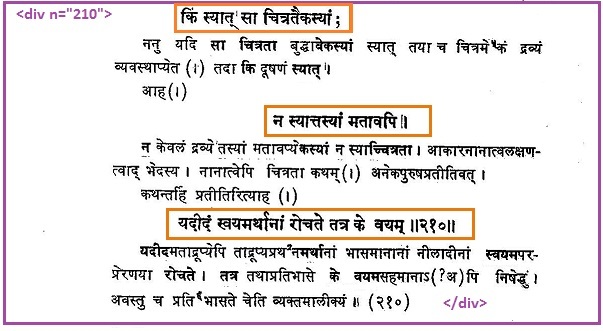 The enclosing division may also have a type attribute, such as type="sūtra", which tells us that it gathers the portion of the commentary that concerns a given sūtra. This attribute, too, is optional. Commentaries sometimes have material that doesn’t correspond to a particular section of the base text: the most common example is introductory material. This material, too, must be put in an enclosing division; the only difference is that this division will not contain any base text elements. Sometimes what we think of as a single section of the base text (a verse, paragraph, etc.) is split up between several sections of commentary: for example, the commentary might take individual words from the base text in turn. Although the underlying principle is the same—put the base text elements within an enclosing division that also includes the commentary—the base text elements in this case will be fragmented, and we need to provide enough information to allow the structure of the base text to be reconstituted. Thus the elements of the base text should be labelled as specified below (in the “verse fragments” section). texts in the corpus are broadly consistent in the encoding strategy used for these sections. ), but these type attributes may be included in order to make the XML easier to read. The strategy followed in the text can be, and should be, documented in the reference declaration (<refsDecl>), which is part of the encoding description (<encodingDesc>) in the TEI Header (see above). Divisions (<div>s) are block-level elements, and they constitute the text hierarchy, together with other block-level elements like paragraphs (<p>), verses (<lg>), and the “anonymous blocks” used for sūtras and the like (<ab>). The overall reference system of the text will therefore usually include the numbering of <div> elements at the upper levels and the numbering of <lg> or <ab> elements at the lower levels. Headings and trailers are short “paratexts” that announce the beginning or end of a section. These may be original to the text, or added by scribes or even the editor: the general rule, however, is that if it is included in the printed text, it should be included in the digital text; if you determine that the editor or a scribe was in fact responsible for adding some or all of these “paratexts,” TEI allows you to hold him responsible and ultimately filter out such interventions if desired. See “holding people responsible” in the SARIT Full guidelines. SARIT uses the TEI element <trailer> for those short pieces of text (often called colophons) that come at the end of a section. <trailer> should typically be the final element in the element that it closes. SARIT recommends encoding the page and, where possible, line numbers of the source edition for purposes of reference. (The digital text will have its own lineation and pagination depending on the media in which it is viewed.) These are encoded as “milestone” elements, that is, single elements that mark the transition from one unit to the text. Sometimes other kinds of milestones besides lines and pages are noted in source editions, for example manuscript folios. Specific guidelines for the use of these elements are provided below. ). And also like line-breaks, we assume that the breaking element and the corresponding number refer by default to the principal source edition. Manuscript folios are treated as pages, so the beginning of a new manuscript folio (or a new side of a manuscript folio) is encoded with the <pb> element. These elements have an ed attribute that refers to the manuscript (the manuscript itself should be mentioned in the source description of the TEI header). Prose paragraphs should be encoded using TEI’s <p> element. Metrical lines are not typographic lines. A typographic line break, encoded as <lb>, might occur in the middle of, or at the end of, a metrical line. A metrical line usually consists of two metrical quarters (pādas), and thus a verse usually consists of four quarters. The juncture between two quarters is a kind of break or pause, and therefore we encode it using the TEI element <caesura>. Sometimes the parts of a verse are broken up within a text, for example when a commentator breaks up a verse to discuss its components separately. In these cases, every verse-fragment should be contained in an <lg> element with the attributes next, prev, or both. All of the verse-fragments should have an identifying label (a, b, c, etc. ), e.g. to be found. However, it will not join fragmentary <l> elements into a single element. Therefore it is recommended to use the part attribute on any fragmentary <l> elements: I for an initial fragment (e.g., pādas a or c) and F for a final fragment (e.g., pādas b or d), or M for a medial fragment if such a case occurs. Often verses are “embedded” into paragraphs, and we reflect this fact by embedding the <lg> element into the <p> element. Sūtras are like paragraphs, but they are often formatted differently (without indentation, for example) and they do not have the “semantic baggage” of a prose paragraph. SARIT recommends the use of the <ab> element (“anonymous block”) with the attribute type set to sutra. 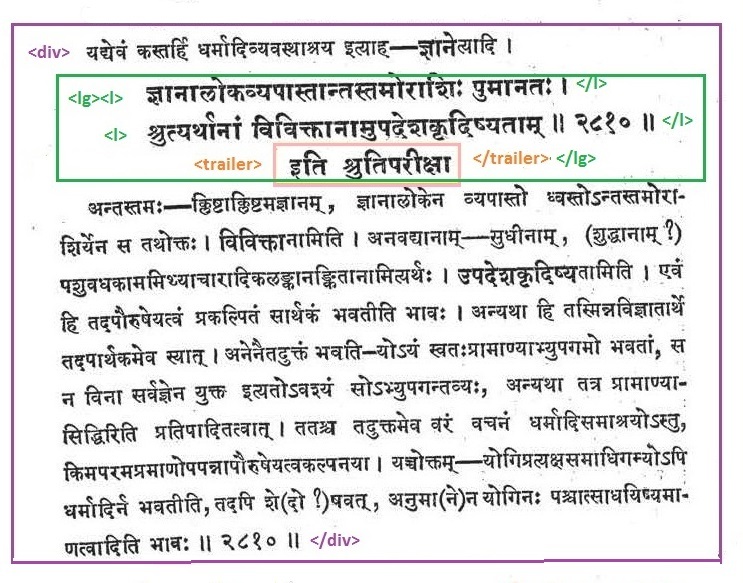 In the following example, the <ab> element includes, in addition to the text of the sūtra, two typed labels that provide, respectively, the serial number of the adhikaraṇa in which the sutra occurs, and the position (pūrvapakṣa, uttarapakṣa, or siddhānta) that the sūtra represents. SARIT uses the core elements of the TEI’s drama module for Sanskrit plays. Plays usually consist of divisions, such as an aṅka, in which various characters speak lines in prose or verse. The standard element for a “line” in this sense is <sp>: this contains the lines spoken by the character, either as prose (<p>) or verse (<lg>). The <sp> element may also contain a label for the speaker and stage directions. The speaker is encoded in the element <speaker>, and stage directions in the element <stage>. You should omit any formatting the editor has used to distinguish these elements. 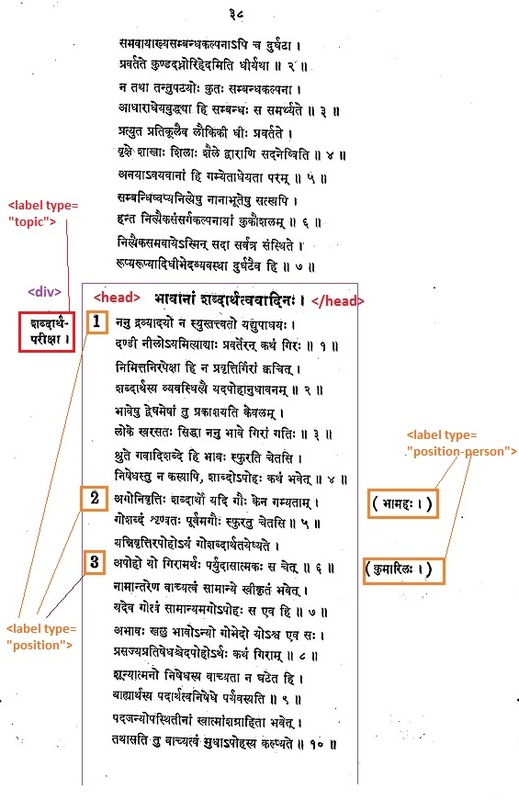 The source edition will sometimes have labels added by the editor, which help to identify sections (below the level of the sections explicitly encoded as <div> elements), positions in an argument (pūrvapakṣa, uttarapakṣa, siddhānta), or other features of the text. It will also sometimes have notes, whether those are represented as footnotes, endnotes, or otherwise. It is possible to represent both labels and notes using TEI’s <label> and <note> elements.
. Similarly, it is recommended to find consistent type attributes for <label> elements as well, and to avoid the use of formatting-specific attributes (like place and rend). Notes are often represented in printed editions with a note marker in the main text, and the note text either at the bottom of the page (as footnotes) or at the end of the chapter or text (as endnotes). SARIT embeds notes into the text in their proper place. That is, wherever you see a note marker in the text, that is where you should place the <note> element. The content of the <note> element depends on the type of note that it represents. Typically, however, notes will contain a <p> element. For text-critical notes, the simple version of the guidelines recommends the use of prose paragraphs; more sophisticated methods are available in the full version of the guidelines. For the simple level of text encoding, we recommend encoding quotations “as-is.” That is, if the editor has used quotation marks or double quotation marks, put them into the digital text; if the editor has used bold-face text to represent quotations, use the <hi> tag (for “highlighted”). The reason for encoding quotations “as-is” is the possibility that identifying the beginning and end of quotations may require extensive checking by skilled readers, and the frequency with which quotations are represented inconsistently in printed editions. Of course, if project resources allow, quotations can be encoded by following the suggestions in the full version of the guidelines. 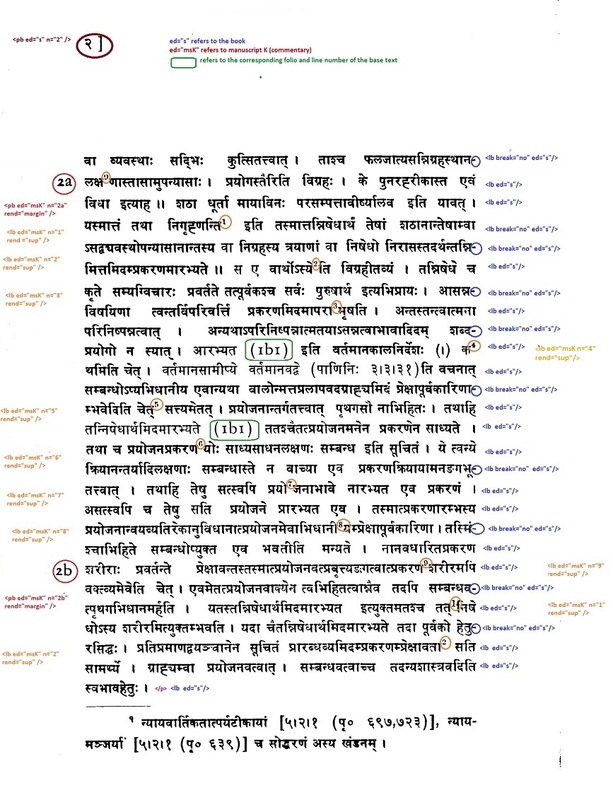 The particle इति, which marks quotations in Sanskrit, can be tricky: it often combines with the previous or following word, which can often mean that there is no typographic separation between a “verse” and the prose it’s embedded in. While there are ways of marking the beginning and ending of quotations, discussed more extensively in the SARIT Full guidelines, we don’t worry about quotations in SARIT Simple, and we are free to adopt the following straightforward principle: follow the typography of the printed edition. 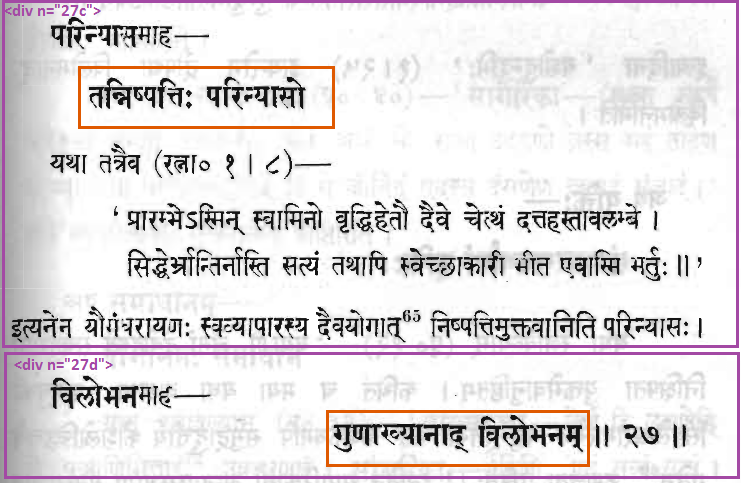 If the edition prints इति on the same line as the verse, include it there, within the <l> element; if it prints इति on a following line, then put it outside of the <lg> element. base text: The text on which the current text is a commentary. Since a base text only makes sense in relation to a commentary on it, this term is only used within a commentary. Sections of the base text that are quoted in the commentary (the current text) are enclosed in <quote> elements with the @type="base-text". root text: see base text.